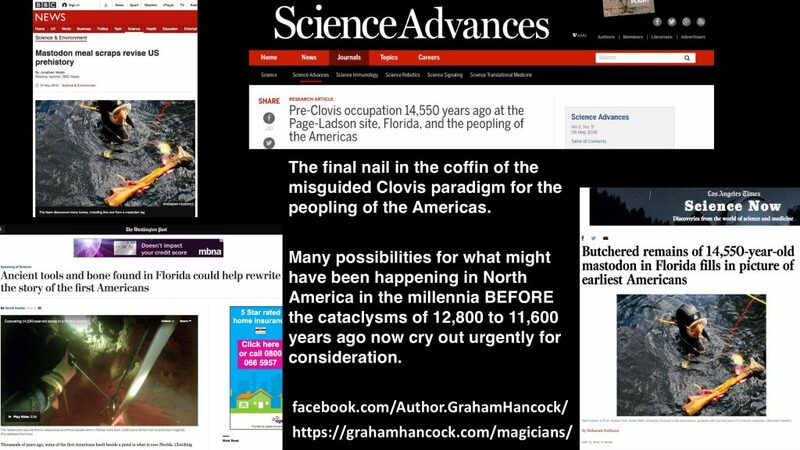 In my new book “Magicians of the Gods” (https://grahamhancock.com/magicians/) I present evidence for the cataclysm of horrific proportions that overwhelmed North America 12,800 years ago. I believe that an important part of the human story was lost to us then — an advanced global civilization that had flourished in remote prehistory and that was almost completely wiped out during the “Younger Dryas” earth changes of 12,800 to 11,600 years ago. Until recently archaeologists en masse subscribed to the so-called “Clovis model” according to which there were no humans present in North America before about 13,000 years ago, with the ancestors of all Native Americans crossing the Bering landbridge from Siberia at around this time. Despite many anomalous findings that contradicted the basic assumptions of this model it has been the ruling paradigm for decades, closing minds to other potentially much more fruitful possibilities. The new discoveries from Florida (see collage of reports in the illustration above) should settle all this. North America was populated thousands of years earlier than had previously been accepted. Undoubtedly some of those early settlers were hunter-gatherers — as evidenced from the Florida site. But did others from a more advanced civilization walk amongst them? And when the cataclysm fell, what happened to these “Magicians of the Gods”? I suspect the true story of the peopling of the Americas has only just begun to be revealed. Whether it’s Gobekli Tepi, the Longyou Caves, or this discovery in Florida, your theory of the ancient lost mother civilization is being vindicated left and right. Thank you, Graham, having the courage and the conviction to bear so much for so long to now see your work come to such amazing validation from so many sources. I know you will keep fighting for the public awareness of these profound truths, and I look forward with great anticipation to see what may come of your work soon. I just hope it’s soon enough to see with greater clarity what the great cataclysm was so we may research and prepare if the possibility looms again.
. . . The “Clovis model,” in my humble opinion, was not complete then nor is it now. One would suggest a reversion back to hunter-gatherer like living standards out of desperation in areas dramatically and environmentally changed after cataclysmic events because survivors remembered how to. A massive impact and/or multiple impacts in close succession would certainly cause enough chaos to take action. One might also observe something of this survival activity today after earthquakes, hurricanes and typhoons, long duration rains and repeated flooding to say little about idiotic human induced war like destruction depicted during a 24-hour news cycle. Some fossil pieces found around Clovis, for instance, suggest origins from abroad tossed into the mostly reddish-clay dirt, especially, when some of them are like rock-hard fossils of a grayish muck laced with a hardened layer of what looks like a whitish-sandy intrusion layer along with obvious shell fossils. That the region was once underwater is no stretch of the imagination, but where did that rock hard white laced fossilized muck come from? Out of place, fossilized muck is one thing, but that “Atlatl” device, large-sized dart or spear thrower, presumably, an effective hunter’s tool for protein on four legs, in one’s view, has hidden sophistication within its construction not fully appreciated by some archaeologists – Certainly not by those refusing multi-disciplinary input in its design. It is the “lever action,” a modified simple machine by any other name, designed into the device that enhances the physical arm-throwing lever action to become an enhanced throwing device. A biophysicist might take that ‘Atlatl’ device, attach some ligaments, tendons, and opposing muscles to it, and by some strange consideration, should they dare, suggest that it [atlatl] was the remains of a throwing arm of a first rate pitcher on the mound. Heh! Heh! A bit much, I suppose. My point is, is that humankind, to paraphrase what Plato mentions, is very much the child finding neat and fun toys even starting over or recovering from a significant bout of head trauma. Evidence of massive cataclysmic impacts remain disputed, yet some folks of academia seem to want that destructive scenario repeated just to fulfill some scientific repetition of proof. A bit dangerous and where would one wait it out? Perhaps on Jupiter where comet fragments are small fry resulting in photogenic speckles from afar.. That ‘Atlatl,’ in ones humble opinion, was not thought of or constructed by a club-wielding ignoramus. There’s significant understanding of the physical sciences, as are now known, embedded in its construction. The Florida find, should it pan out, is probably another tip-of-an-iceberg floating in those warm waters. That general region, Florida Straight, Caribbean, Bahama Islands, and shorelines of the Gulf of Mexico, already have anomalous findings on land and underwater conveniently ignored by mainstream academia. Remote satellite sensing demonstrates as much inland despite what Bing and Google maps allow. The peopling of habitable and arable lands after cataclysms cannot have been easy. Even today, clean-up and rebuilding is difficult.
. . . The “Clovis model,” in my humble opinion, was not complete then nor is it now. The Florida find will not settle things, either. It does shed light on how much work is still needed to correct written history and help dig out those of academia who’ve accidentally slid into paradigm snags that hamper adjustments in accepting newly found evidence. Excessive presumption seems the cause for failing to adjust one’s hypothesis or theory when evidence more than suggests a new story line. Paradigms are like tar pits, best not to get stuck in one in the first place because others did so.